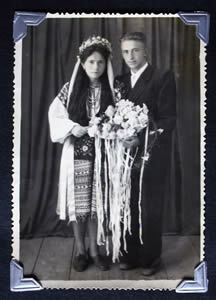 Wedding ceremonies and customs are a valuable entry point to understanding a culture. May 28 – August 1, 2015, CMEF will present an exhibit on weddings customs of nine Alberta communities. Each community’s story will be told through wedding gowns, wedding videos, and displays. Lectures, films, and a reception will amplify the exhibit’s message. Through the gowns, photos, video clips, music and interpretive materials, visitors will experience the similarities and differences between the wedding ceremonies of different peoples. Out of this exploration will come a richer appreciation of what we share as well as a deeper understanding of how we differ. The program will be promoted through newspaper, radio and social media. Lectures, films, and a reception will draw additional visitors. The exhibit has received funding assistance from the Edmonton Heritage Council. The Edmonton Heritage Council is providing funding assistance for the exhibit.